Herbed White Bean Soup. Flickr User "thebittenword"
White beans sometimes carry the connotation of being boring. I prefer to view them as a delicious, blank culinary canvas, though. For one, I think their creamy texture is nothing short of addictive; it adds a velvety mouth-feel to any dish, without adding any fat. Combine that with the fact that they’re a great source of inexpensive protein and they’re almost impossible to cook wrong. 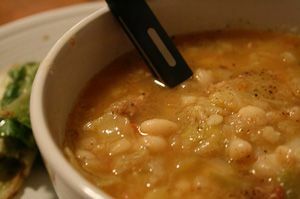 This herbed white bean soup recipe is punched up with classic Provencal spices to delicious effect. Cover the beans with 1 inch of water and soak them overnight, or bring them to a rapid boil, cover and set aside for 1 hour. Drain the beans, place them in a large saucepan, and add the chicken stock, water, ham, carrots, onions, and seasonings to the pan. Bring the mixture to a simmer over low heat and allow the soup to cook for 90 minutes to 2 hours, until the beans are tender. Add the mashed potatoes and simmer the soup for an additional 5 minutes. This herbed white bean soup makes 8 to 10 servings.